URGENT: Californians: Need someone to drive injured pij from Sta Monica to Lake Forest. I am helping Terry at FB. She's looking for someone who could help drive an injured pij from Sta Monica to Lake Forest. That's Barbara's pigeon, isn't it? 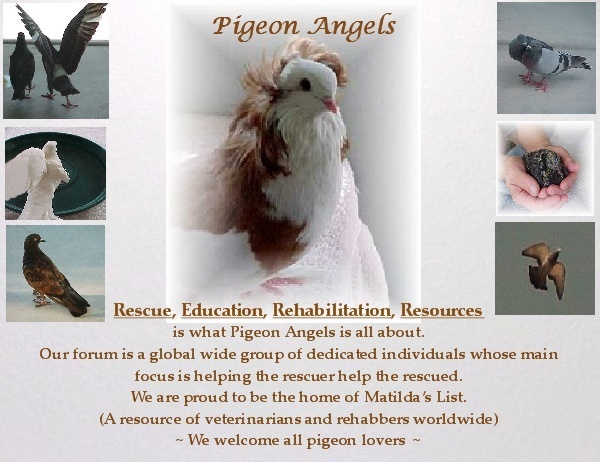 I don't think we have any members near Santa Monica, so I contacted first Elizabeth of Mickacoo and then Terry about this rescue. I'm so happy that Terry is able to help, and thank you so much for trying to organise transport for him. I hope someone is going that way soon and may be able to take him. Good luck! Thanks for all your help, Tech. Subject: Re: URGENT: Californians: Need someone to drive injured pij from Sta Monica to Lake Forest.